Stake is a top rated, simplistic and very easy to use crypto casino that offers a variety of games. Stake is a top rated crypto casino that is simple, easy to use and a very aesthetically pleasing website. It is a very transparent Bitcoin, Litecoin, Ethereum, Dogecoin & Bitcoin Cash casino that is provably fair on not only every single game but with every single bet. Underneath the game options is a current live betting board showing bets placed across which game. You can also flick between the option of all bets and those of high rollers. Stake is available in 6 different languages including English, French, Portuguese, Spanish, Russian and Japanese opening the casino to a diverse range of players. While most casinos have deposit bonuses they generally have very high (40x) wagering requirements with other strings attached. 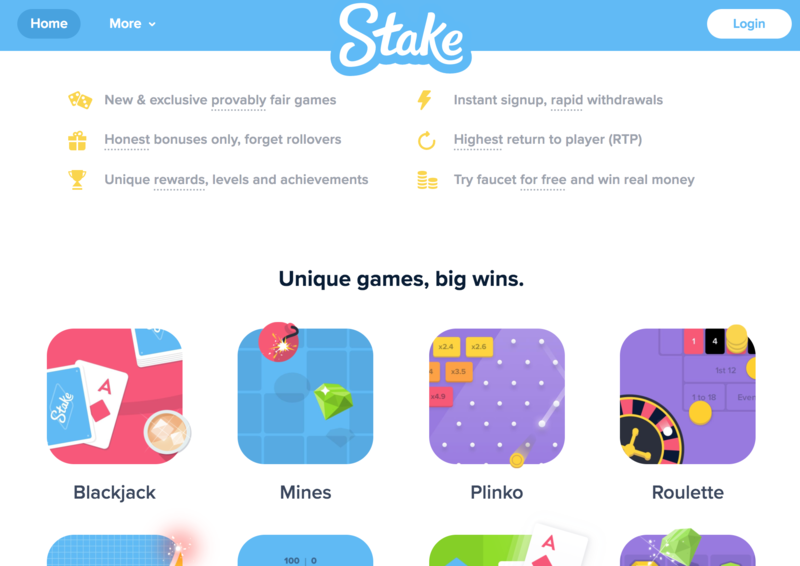 Stake offer a free Bitcoin to play with courtesy of their faucet, no roll over requirements required! This is a very interesting feature and something that will surely attract more and more players. Depositing is simple, quick and easy. Simply sign up to Stake and upon doing so the wallet address you can deposit to will be available to deposit. Signing up is as simple as choosing a username and verifying your email address. Nothing more. Stake claim to have lightening fast withdrawals as well. This casino is not available to residents of the United States, the United States Territories and Australia. Overall we think Stake is a very pleasing Crypto Casino to use. Signing up and depositing is extremely fast and easy. There may only be 12 games to choose from but they are all provably fair, fun and entertaining. In addition to this Stake also have a faucet allowing the user to claim coins use in the casino or to withdraw.